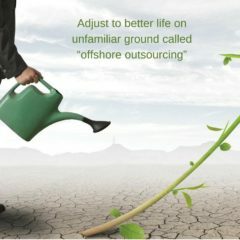 Stepping on a no man’s land with no tools or knowledge to survive environmental hazards and adjust to life is exactly how newbies feel as they tread with caution on the unfamiliar ground called “offshore outsourcing”. Unlike Independent Software Vendors and experienced IT companies that have long captured all the giants on the ground and developed best practices for cooperation with outsourcing vendors, newcomers are still struggling with outsourcing management. Years of work on multiple projects have taught Agiliway team that most newcomers are drawing a blank on how to work with remote teams, collaborate across time zones and create a consistent workflow. Newcomers to the offshore IT outsourcing market are either IT startups or end-user clients looking to Ukraine for expertise and cost-effective software development service. On local markets of the US, Germany, France or UK such expertise usually comes with a high price tag, while skills may not be available internally. When the company needs to extend an existing in-house team with outsourced workers, our cooperation is built on functions relocation. This implies that an outsource service provider takes on the responsibility for hiring and training talents, providing a workplace and all necessary facilities, while the client submits assignments. Before reaping the benefit on the ground called offshore outsourcing one must do away with all the giants and stumbling blocks popping on the way to the project success. As a rule, after the contract is concluded, senior executive tasks middle-level management to oversee the project. The PMs are good at managing operations, coordinating resources and delegating tasks across the internal team within the company. However, when it comes to working across distributed team and time zones, in 80% cases this pattern of partnership goes pear-shaped as in-house PMs often lack the skills and experience of work with remote teams. Luckily, these challenges are easily fought off once you follow the strategy Agiliway has tested on multiple outsourcing projects. Apart from extending your software development capabilities with needed skills, we also aim to ensure smooth and productive cooperation. This preconditions the necessity to align inner processes in view of collaboration with a remote team. Such being the case, Agiliway has drawn up its own methodology to include four key areas of project governance and control. Once the cooperation starts we assign our PM on the project. This is a person with wide experience managing distributed teams who will simplify, plan, mitigate cooperation and oversee local resources by keeping under close scrutiny communication, processes and risks. The step is mandatory for all projects whether the client requested such a role for his remote team or not. The latter being the case, we invest into our local PM to assure successful engagement and positive experience for the client and correspondingly further cooperation. To accelerate decision-making processes between two parties, this three-level model incorporates a clear escalation mechanism. When needed, engineers will take up an issue to the manager, while managers might address their questions about plans, services or strategy to executives. Remote team management often comes upon a snag. Team members don’t work in the same office, they communicate in virtual, not real environments, they feel they want stand-up meetings for receiving tasks, they cannot solve problems by throwing some ideas around in the office or having a few words over the wall. The best the PM can do is to help you stay at the top of the game by integrating necessary tools to blend an outsourcing model into internal business processes. 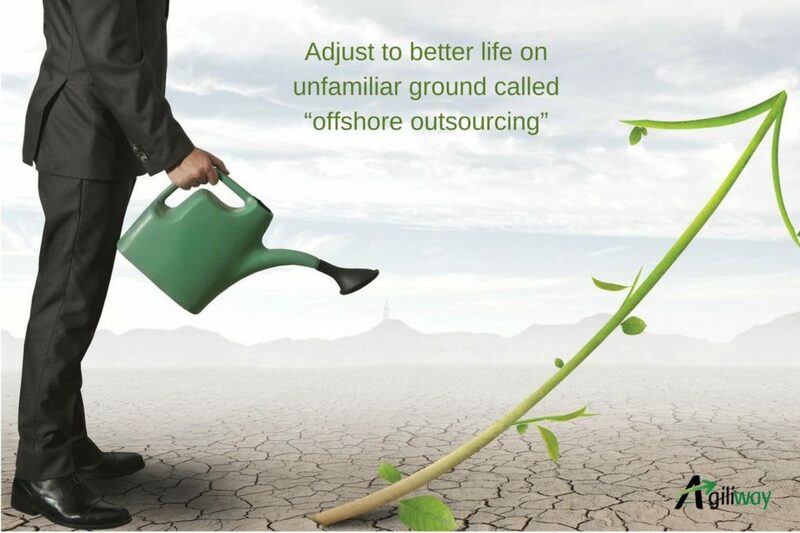 Risks related to offshore outsourcing are numerous. These are weak communication channels, discrepancies between internal processes on the client and outsourcing provider sides, lack of business domain knowledge, cultural differences, and many others. Aware of the risks, PMs and executives implement techniques to mitigate them altogether. Such techniques include but are not limited to constant communication, processes alignment through the entire development cycle, well-documented requirements, proper tools usage, etc. The combination of efficient day-to-day risk analysis and appropriate risk management techniques are critical to successful outsourcing partnership. Outsourcing benefits are hardly overrated. Yet successful partnership takes place only if the client understands challenges offshore outsourcing triggers, while the service provider is competent enough to implement the solution and experienced enough to manage smooth workflow.